Saina Nehwal is back home, where she belongs and where she is most comfortable. And her homecoming from Bangalore, where she has been training for the past three years, to her home town of Hyderabad, has raised a slew of questions. Shortly after her return from Glasgow, where she bagged her second World Badminton Championships medal — a bronze following the silver she had pocketed at Jakarta in the 2015 edition — Saina expressed a desire to return to what was her alma mater — the Pullela Gopichand Badminton Academy (GBA) in Hyderabad, where she had trained and played for the better part of her career, from 2006 to 2014. Despite the acrimonious circumstances under which she had left the Gopichand Academy in September 2014, Saina was welcomed back with open arms by her former coach, with whom she had actually not been on talking terms for the previous three years. Indeed, that had been a major blot in her copybook, as far as Saina’s behaviour was concerned. She had publicly expressed her displeasure over her feeling that Gopi had reduced the amount of time devoted to her, and that she felt constrained to move to a place where she could get more personalised attention. Gopi, on his part, had maintained a dignified silence on the issue, only venturing the opinion that it was entirely Saina’s decision, and that he respected it. During the three years that she trained at the Prakash Padukone Badminton Academy (PPBA) in Bangalore, Saina was guided by former two-time national champion Vimal Kumar to the World No 1 position — where she was ensconced for nearly four months in 2015, over three distinct periods in April, May, and August to October— and to two World Championship medals she won in Jakarta and Glasgow. Not a bad record at all! 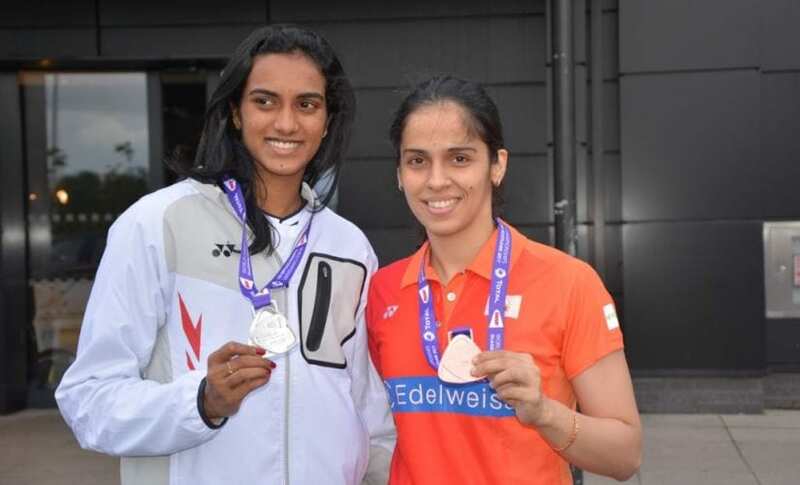 PV Sindhu and Saina Nehwal pose with World Championship medals. Saina’s most recent medal was won in Scotland after having made a full recovery from knee reconstruction surgery, undergone at the end of the 2016 Rio Olympics, in September last year. That was when, in a fit of depression, she had declared that she feared her badminton career was over. It was Vimal who guided her through the difficult period of rehabilitation to the World Championships bronze medal. So what does Saina’s move back to Hyderabad say about what she thinks of Vimal’s coaching? And how have Saina and Gopi reconciled to the three years of indifference that the two displayed in each other’s presence? Some answers are forthcoming from the statement that Saina posted on the subject on her Facebook account, and the press statement that Vimal made in Bangalore after reading some disparaging reports in the local media. “Hi friends, I wanted to share some news with everyone. For a while, I’ve been thinking about moving my training base back to the Gopichand Academy, and I had a discussion about this with Gopi sir, and I’m really thankful to him for agreeing to help me again. At this stage in my career, I think he can help me achieve my goals. Saina, it will be remembered, had been effusive in her praise of fellow-countrywoman PV Sindhu’s efforts in the gold medal clash at the World Championships, even stating ‘Unko dekhte dekhte mera petrol khatam ho gaya!” (Just watching them play drained me out). It was a major change from her previous indifference towards Sindhu in recent years. “Saina, on her return from the World Badminton Championships, asked my opinion on the possibility of working with the Indonesian coach, Mr. Mulyo Handoyo, brought in by Sports Authority of India (SAI), for looking after the singles players in National camps. He is attached with the Gopichand Academy in Hyderabad. “I had indicated to her that there is no harm at all in her giving it a try. Players have a short span at the top, and will always be looking at ways to get better. Saina and Sindhu are special girls; and, if they are able to get even better, we should provide them with those opportunities. Several photographs taken at Glasgow at the end of the 2017 World Championships show the camaraderie between the four protagonists — medallists Sindhu and Saina, and coaches Gopichand and Vimal. 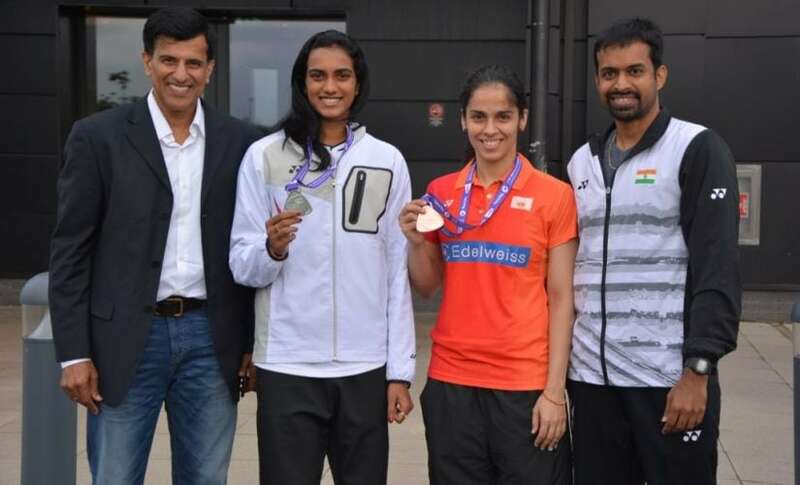 There is a particularly pleasing photograph where Vimal is seen standing next to Gopichand’s protege, Sindhu, while the former All England champion, and now national coach, is seen standing next to his former star pupil, Saina. Vimal Kumar, PV Sindhu, Saina Nehwal and Pullela Gopichand at Glasgow after the recently-concluded World Championships. It is crystal-clear that Saina and Gopichand have decided to bury the hatchet in the best interests of Indian badminton. 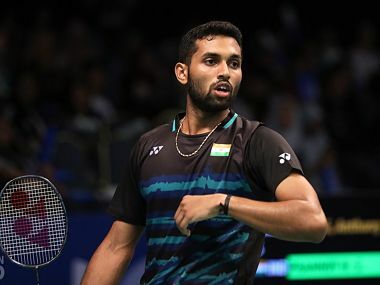 It cannot be doubted that Gopichand would retain a soft spot for Saina, whom he nurtured and groomed to win first the world junior title in 2008, and then a satchelful of Superseries and Grand Prix Gold titles. Saina, on her part, would have been suitably remorseful over the manner in which she had ended her association with GBA in 2014. Let us also be clear about the massive contributions of both Gopichand and Vimal to Saina’s progress. The 27-year-old has herself admitted that she was never a naturally talented player, but blossomed under the tutelage of Gopichand to become a world-beater. Vimal complemented Gopi’s efforts, and helped her reach the very top. Saina’s success at international level is something that has caused a massive renaissance in badminton in India, and led to substantially enhanced interest in the game from fans, and also induced a boom in the number of people playing the game at competitive level. While Saina does not in the least denigrate Vimal’s work with her, and readily extols every milestone she crossed in her career when under his care, she is convinced that her future lies with GBA, where she can gain substantially from the training imparted by Indonesian coach Handoyo, who had coached the 2005 world champion and compatriot, Taufik Hidayat, in his halcyon days. 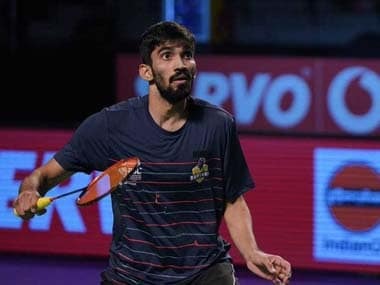 Handoyo’s work over the past year with Kidambi Srikanth, Sindhu, B Sai Praneeth, Parupalli Kashyap, the Varma brothers and HS Prannoy, among others at GBA, has turned them into feared competitors, who can beat anyone in the world on their day. He changed their training regimen, and made them faster, more flexible and fitter. It had been a stamina issue that had caused Saina to lose to Japan’s new world champion, Nozomi Okuhara, at the semi-final stage of the recent World Championships, even though she showed no sign of the terrible knee injury that had laid her low a year back. After storming through the opening game at a blinding pace, the Indian had failed to maintain that level of speed in the remaining two games, and paid the price. Now that Saina, acknowledged as one of the hardest workers in the world, has shown complete recovery from that injury, the Indonesian could help take both her fitness levels and her game a step further. Moving back to GBA has been a wise and pragmatic move for Saina, and a pat on the back for Gopichand, but by no means an affront to Vimal’s abilities as coach.